KG KG-410 Lightweight Gun Oil. 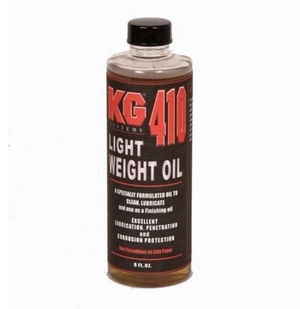 KG’s Light Weight Penetrating Oil is intended for use when a fast, temporary cleaning is necessary. Hunters and range shooters can quickly spray KG-410 on the firearm to protect it after a day of shooting and until you can clean it properly. The KG-410 is also used after the refinishing process to help the coatings resist burnishing. 8oz bottle.